Today’s prompt is “A Song That You Think Everyone Should Listen To”. My choice isn’t so much the song vocals-wise but the most amazing sax playing. I want to be able to play just a smidgen of this music one day, it’s fantastic. 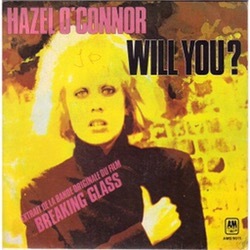 The song is Will You by Hazel O’Connor and it’s from the film Breaking Glass, which I’ve never seen so can’t say if it’s worth a watch. Well, it starts off very mellow and gentle and you’re thinking “hmmm, good with coffee or wine, staring into an open fireplace or a candle…etc” and then the sax starts and it just veers off into another dimension of wondering just how a saxophone can be played to produce the immense solo pieces. Yep, I like the saxophone! If you want to just hear the sax, it’s here, thanks to whoever popped that onto YouTube .